The 22-year old Holywood star had a tough day on the greens but produced some scintillating iron-play and trademark big-hitting to eventually beat Spanish veteran Miguel Angel Jimenez 3 and 1. The Holywood native and England’s Lee Westwood can both go to world number one with victory here tomorrow. And while they are on course to meet in tomorrow morning’s semi-finals, McIlroy knows he will need his best golf to overcome the 25-year old South Korean sensation Sang-moon Bae this afternoon. “I felt like I played my best golf of the week today,” McIlroy said. “I hit a lot of quality shots. I still hit a couple of lose ones, but for the most part I felt like I drove the ball great. I hit a lot of iron shots close to the pin. Bae beat McIlroy by five shots in a final round duel to claim the 2009 Korean Open and also won three times on the Japan Golf Tour last year to claim the money title before earning his PGA Tour card at the qualifying school. Rory McIlroy splashes out of a bunker on second at the Ritz-Carlton Golf Club on Friday. Picture Fran Caffrey/www.golffile.ieThe Irish world No 2 could erase Woods from the record book and become the youngest winner of the Accenture Match Play and a World Golf Championship. But he admitted that knowking he has a chance to become world No 1 has made him more determined to win here. Westwood eased to a 3 and 2 win over American young gun Nick Watney and will now face Scotland’s Martin Laird, a 3 and 1 winner over compatriot Paul Lawrie. McIlroy was always in charge against veteran Spaniard Miguel-Angel Jimenez, being three up through the turn and playing solidly on the way in to close out the match 3 and 1 on the 17th green. The Ulsterman confessed that he should have closed out the match earlier but he ended all doubts when he boomed a 350-yard drive down the 17th fairway before following up with a wedge to three feet as Jimenenz missed the green and failed to chip in. Westwood, the 38-year-old from Worksop, looked like a man in almost total command of his game as he despatched the promising Watney by 3 and 2. He has yet to fall behind in any of his matches so far this week. He was ranked number one in the world for 22 weeks until Luke Donald relieved him of the crown by winning last May’s BMW PGA Championship at Wentworth. Lee Westwood on the first green at the WGC - Accenture Match Play Championship o Friday. Picture: Fran Caffrey www.golffile.ieBut with Donald exiting in the first round in Tucson this week, world number three Westwood and second-ranked McIlroy both have a chance to go to number one with victory here tomorrow. Donald was never behind in any of six matches last year as he lifted the trophy on Dove Mountain. And Westwood was on course to match his Ryder Cup team mate’s following another impressive performance yesterday. He was in command from the very first hole, where he split the fairway and rifled a wedge to eight feet and clinically rolled in the putt. He easily won the second to go two up, chipping dead from short of the green as Watney short-sided himself in the left trap and failed to get up and down. The American cut the deficit at the par-three third, where Westwood failed to save par from the bunker right of the green. The world number three went off the boil in the middle of the front nine and the turning point came when he hit two poor shots to the seventh and escaped with a half in bogey to remain one up. Watney was 54 feet away but three-putted to let the 38-year old from Worksop off the hook and then lost the par-five eight to a birdie to go two down. Westwood stretched his lead to four holes with a winning par at the ninth and a brilliant birdie at the 10th, where he hit a 160-yard approach to 18 inches. Halves in birdie at the 11th left Watney four down and staring defeat in the face and while he won the 12th with a par as Westwood bunkered his tee shot, it was only a case of prolonging the inevitable. After halves in birdie at the par-five 13th and the driveable, par-four 15th, Westwood finally closing out the match at the 16th. McIlroy was not quite at his best for the third day in a row but still looked to have too much firepower for Jimenez, who was bidding to break Des Smyth’s record and become the oldest winner in the history of the European Tour. The 22-year old looked hesitant on the greens early on before hitting some quality irons shots to put the Spaniard under severe pressure. After lipping out for a win from five feet at the first, McIlroy edged the second with a sloppy par-five after short-siding himself in greenside sand with Jimenez forced to lay up. Sang-moon Bae will face Rory McIlroy in today’s quarter-finals. Picture Fran Caffrey/www.golffile.ieHe lost the third to a par, failing to get up and down from greenside sand but won the fourth with a conceded birdie to go one up, missed a six footer for a win at the fifth but then doubled his advantage when he hit a 144-yard wedge to a foot at the seventh. McIlroy then went three up with a 180-yard missile to six feet at the ninth and while he lost the par-five 11th to a par after a wild drive into the desert, he had enough with a bogey at the par-three 12 to go three up again before Jimenez took the par-five 13th in birdie to reduce the arrears to two holes. One of the keys to his victory came at the 15th, where Jimenez drove the green. McIlroy followed him in with a 328 yard three wood and matched his birdie. Then at the 247-yard 16th he hit another superb approach shot to just 13 feet to keep the pressure on the Spaniard. He could have closed out the match there but missed the putt. Woods complained on Thursday that he had found the greens difficult to read and while McIlroy insisted that he had found them straightforward, he changed his tune yesterday. “I misread a couple at the start. And then I got JP in and felt like I putted a little bit better. I said yesterday that I wasn’t struggling reading the greens, and then all of a sudden today I couldn’t read them well. “They’re tricky. They’re very tricky. You’ve got a putt with a slope going one way and the valley is the other and the grain looks another way. You can confuse yourself sometimes. And then if you do get the right line, you’re usually going to leave it short because that’s all you’re concentrating on. 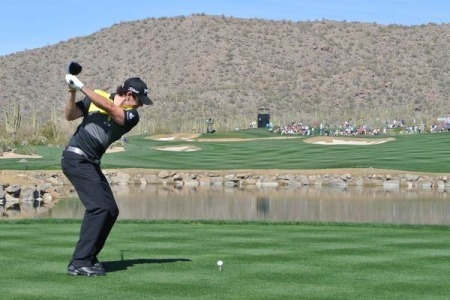 Sweden’s Peter Hanson hits his approach to the first in the third round of the WGC-Accenture Match Play Championship. He beat Brandt Snedeker 4 and 3. 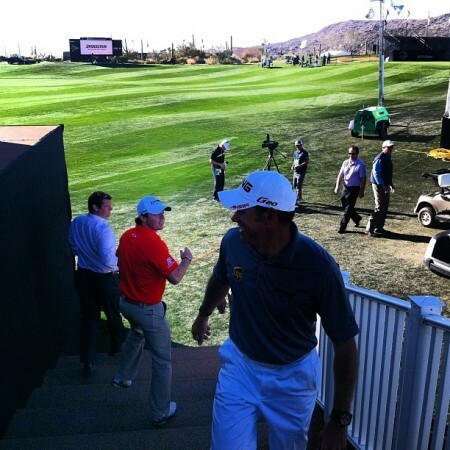 Picture: Fran Caffrey www.golffile.ieAs for a potential clash with Westwood, McIlroy said a lot while saying little. Their rivalry is a fierce one, dating back to the 2009 Dubai World Championship when the Englishman outgunned his less experienced, now former stablemate and went on to win the Race to Dubai. From that week forward their relationship has been famous for their “banter” on Twitter and some choice comments by Westwood during last year’s Masters (“he does have a pull hook in his bag” in reference to the 10th hole) and US Open (“He’s lost leads before” on the eve of the final round). 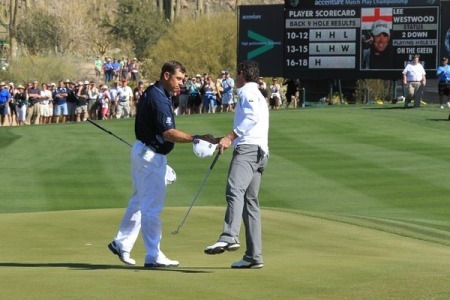 Graeme McDowell described the trading of blows on Twitter as “jokes with jabs” and it was interesting that McIlroy immediately unfollowed Westwood on the social networking site when he left ISM to join Horizon last year. The difference is that McIlroy is now a major winner - the reigning US Open champion. He may need to play like one today to achieve a boyhood goal this week. How he’d love to hear Westwood call him “No 1”. 1705 Peter Hanson v Mark Wilson; 1720 Matt Kuchar v Hunter Mahan; 1905 Rory McIlroy v Sang-moon Bae; 1920 Lee Westwood v Martin Laird.